Last month saw a major attack on ethnic studies in Arizona, centered around the banning of the Tucson Mexican American Studies (MAS) program. This attack is about more than simply curriculum — it is about which stories can be told, and which people can tell them. It is part of a centuries-long struggle to define “America” and to control the narratives we live by. This month, February 2012, people across the country are fighting back. 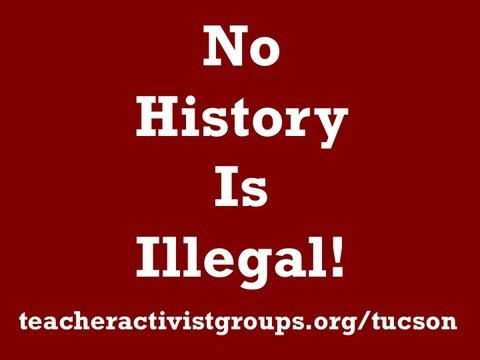 One effort, the “No History is Illegal” campaign, asks educators to stand in solidarity with MAS by pledging to teach about the struggle in Arizona, and use the MAS curriculum, in our homes, schools, community centers, churches, and wherever else learning takes place. To pledge your support, and to download a document from the Network of Teacher Activist Groups with curriculum samples and ideas, click HERE. The following is a poem that is read at the beginning of all MAS classes. It can serve as a moment of reflection, and a jumping off point for discussions about this crisis. If they close one program, let a hundred spring up in its place. No history, no poem, no culture, is illegal.